Hot-melt extrusion (HME) technology has been a widely used manufacturing process in the plastics industry for more than half of a century and has recently been demonstrated to be a “continuous process” for the pharmaceutical industry. Over the last two decades, pharma has gradually focused on HME techniques for many drug delivery applications, which is evident from the scientific literature. In the last 15 years, over 200 research papers and many several reviews have been published on the subject. In addition, HME patents issued world-wide for pharmaceutical systems have increased since the early 1980’s. HME offers several advantages over traditional processing techniques for pharmaceutical applications. The process is anhydrous, entails a continuous operation necessitating fewer processing steps, entails no organic solvents, requires no compression of the actives, and improves bioavailability due to dispersion of the drug at the molecular level in the final dosage forms. All of the components in the formulation must be thermally stable at the processing temperatures utilized, which may limit the extrusion of thermosensitive actives. However, advent of new techniques such as a combination of HME with nanotechnology, powder coating and complexation over the last several years continuously adds active pharmaceutical ingredients (APIs) to the HME list of candidates. 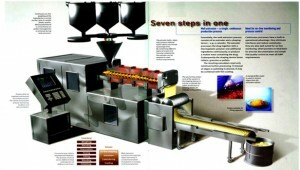 Advancements in types of extruders have also expanded the number of drugs available for processing. For example, twin-screw extruders with flexible screw designs and inclusion of injection ports at different stages within the barrel permit the pharmaceutical scientist more freedom in the development of intricate dosage forms. The extrusion process involves conversion of the API and excipients into a product of uniform shape (such as a fast-dissolving film or tablet) and density by forcing these materials through a die under controlled conditions. In HME, the meltable substances may be polymeric materials or low melting point waxes. Hot-melt extruded films may be produced separately and layered post-extrusion, or a multi-layered system may be co-extruded. In addition, pellets, tablets and capsules may be produced with this continuous process. The bioavailability of the drug substance for oral and other delivery routes may be improved when it is dispersed at the molecular level in HME dosage forms. New chemical entities, isolated natural compounds, and currently marketed drugs that demonstrate a low bioavailability due to solubility issues are prime candidates for this technology. Thus, hot-melt produced dosage forms present the pharmaceutical scientist with new opportunities, including the attainment of zero-order drug release when desired.